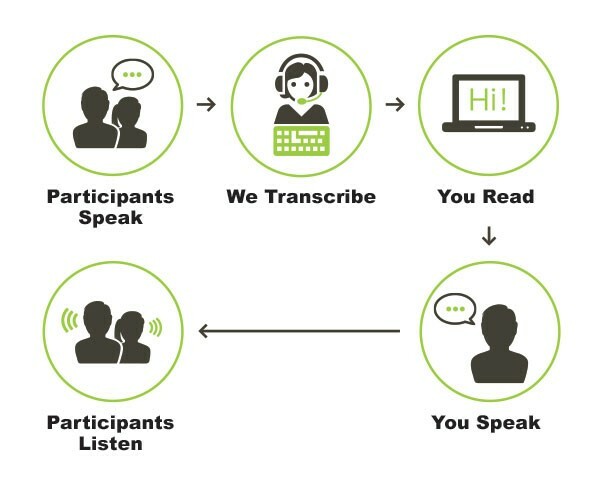 Sprint Teleconference Captioning (STC) combines real-time captioning and voice relay service through an internet connection. A fully-customizable transcript window allows you to follow the meeting comment-by-comment. Using the same high-quality captioners that produce closed captioning for television, you can receive live, real-time text streamed to an Internet browser on a computer, or mobile device. A high-speed Internet connection is required. Participants can follow along with the dialogue by reading it on-screen as it is spoken and captioned. All captioned dialogue is added to an event transcript if the transcript service has been requested at the time the event was scheduled. High-speed internet connection (DSL, Cable, Wi-Fi or wireless network*, etc.) *Data and standard message rates may apply.